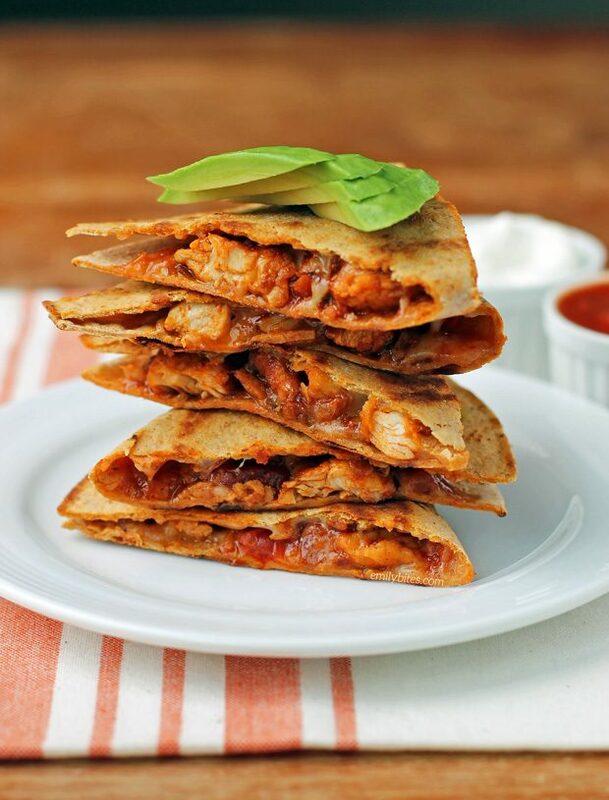 I have partnered with Flatout to create these Easy Chicken Quesadillas. I have been compensated for my time commitment to work with their product, however my opinions are entirely my own and I have not been paid to publish positive comments. These Easy Chicken Quesadillas are my new obsession. They’re super easy and flavorful and they taste incredibly decadent for just 286 calories or 6 Weight Watchers SmartPoints! Such a points/calorie bargain. The chicken is spicy and smoky and with the melty cheese and juicy salsa in a crispy Flatout flatbread it’s basically comfort food paradise. One you make the chicken (which only takes a few minutes), it takes only moments to throw together a quesadilla whenever you want one – how amazing is that? These Easy Chicken Quesadillas are simple to customize if you want to add fillings or toppings. I love them as-is but they’re also fantastic topped with fresh avocado slices or dipped in salsa, sour cream or guacamole. If you’ve been reading my site for a while, you already know about my love for Flatout flatbreads. They’re tasty, versatile, full of protein and fiber and now endorsed by Weight Watchers® – what’s not to love? I always have some in my pantry because they make quick and easy pizzas, wraps, quesadillas, pinwheels, sandwiches and more. Perfect for planning to use in a healthy recipe or for dinner on the fly with whatever is in your fridge. Looking for more recipe ideas using Flatout flatbreads? Check out my Taco Flatbreads, Buffalo Chicken Tacos, Greek Chicken Tacos, BLT Flatbreads, Savory Sausage Pumpkin Flatbreads, Chicken Caesar Wraps, Veggie Lover’s Flatbread, Black and Blue Steak Wraps, Easy Taco Cups, Spicy Southwest Chicken Wraps, Peaches and Cream Dessert Flats, Three Cheese Mushroom Flatbreads, Maple Bacon Breakfast Wraps, Chicken Saltimbocca Sandwiches, Buffalo Chicken Pinwheel Wraps, Spinach Artichoke Flatbreads, Greek Snack Flats, Mexi Burgers with Guacamole, Chinese Chicken Wrap, Chicken Pesto Flatbreads and Bacon Cheeseburger Wraps! Place the chopped chicken into a zip top bag and add the southwest seasoning. Seal the bag and shake/massage the chicken until coated with the seasoning. Place the oil in a large skillet and bring over medium heat. 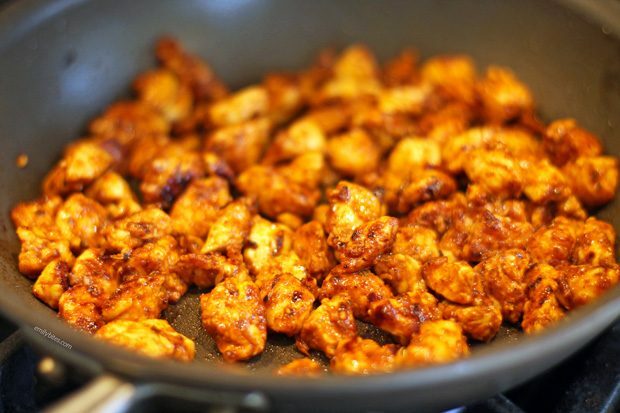 Add the seasoned chicken and stir to coat with oil. Cook, stirring occasionally, for 4-6 minutes until chicken is cooked through. Remove from heat. Lightly mist both sides of the quesadillas with cooking spray. Bring a large griddle pan or skillet to medium heat and place the quesadillas on the pan (you may have to work in batches). Cook for about 2 minutes on each side or until the outside of the flatbread starts to turn golden and the cheese inside is melted. 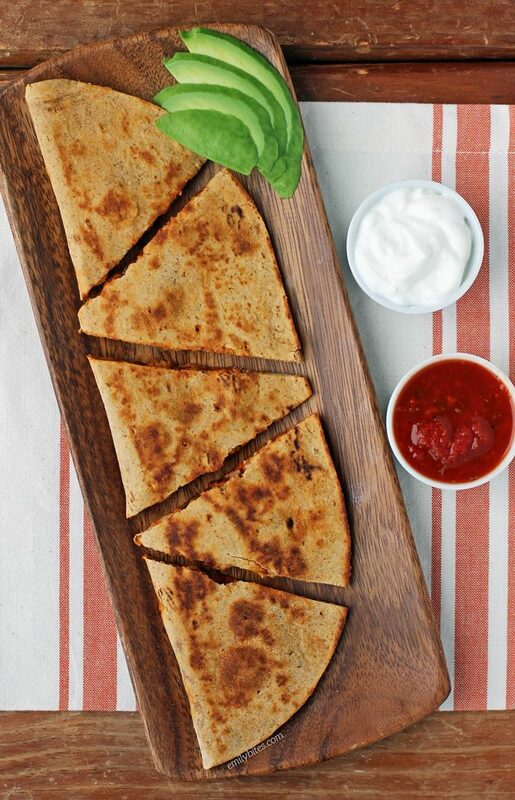 Cut each quesadilla into triangles with a knife or pizza cutter and serve. OMG YUM. I have eaten approx 800 flatout wraps in my life but somehow I have NEVER thought to make it a quesadilla. Making this ASAP! I learned the following from Kenji @ Serious Eats – mix the filling + salsa + cheese together in a bowl then add it to the tortilla/flatout. It’s just one of those tiny things that makes it next level. Super delicious and easy to make. I used Sarah’s suggestion and mixed it all together. Very easy and everyone loved them. Thanks Emily! I’m new here and so excited to start using your recipes! How do I save them so I can find them easier? Thank you!